A longtime client for print services, Shields contacted LW Creative in response to one of our monthly emails. 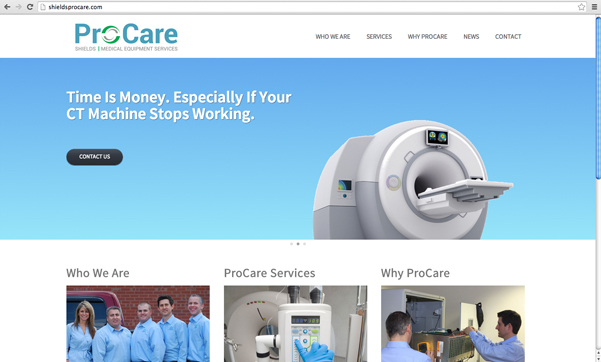 Their new division, Shields Procare, needed a responsive website to showcase their medical equipment management and servicing capabilities. Their first attempt was an in-house solution that just did not work well. ProCare clients look for the best technology in the most reliable equipment, while minimizing costly downtimes and repairs. Their website needed to reflect those high standards. In addition, it was important to communicate the company’s focus on reliability, commitment, quality and efficiency. ProCare wanted to do website updates in-house to reflect new technologies and services as well. A clean, concise, client-updateable website by LW Creative hit all the targets.